Donald E. Carlucci, Sidney S. Jacobson, "Ballistics: Theory and Design of Guns and Ammunition"
Even the earliest weapon developers faced the need to understand how and why guns and ammunition work in order to improve their effectiveness. As weapons became more sophisticated, the field of ballistics naturally divided into three main areas of specialization: interior, exterior, and terminal ballistics. 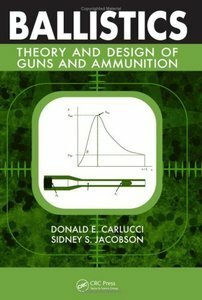 Providing unique coverage of all three areas, Ballistics: Theory and Design of Guns and Ammunition offers a seamless presentation of the complex phenomena that occur during the launch, flight, and impact of a projectile.